Rexroth has optimized the new generation of IndraMotion MLC to technological specifications for hydraulics. The control system thus further simplifies cross-engineering. For connecting sensors and actuators Rexroth relies on its bundled I/O strategy specially designed for high dynamic applications. The hydraulic expertise that goes into interface configuration makes it possible for users with little knowledge of fluid technology to select and operate the necessary I/O components with a high degree of scalability. Specific hydraulic drive design - just like the right assembly of corresponding interfaces - once required a high degree of technological understanding and application expertise. Rexroth now offers new features with the IndraMotion MLC system solution for minimizing time and effort for design and commissioning. The drive and control manufacturer neutralizes specifics for the user through electrical components and software with integrated hydraulic application expertise. Rexroth's IndraMotion MLC equally controls - decentralized and centralized - hydraulic, hybrid, or electric axes. The control software comprises a wide range of predefined hydraulic control functions, therefore the parameterization of motion profiles does not require any expert hydraulics expertise. Rexroth is now intensifying that simplification approach for the design and assembly of fast I/Os in typical applications such as forming or metallurgy. Rexroth's bundled I/O strategy gives users standardized interfaces specially designed for high-dynamic hydraulic applications. The I/Os are available for up to four axes each as compact, cost-effective preconfigured block modules. The IndraControl S20 units enable maximum flexibility for expanding the system into individual steps. This means designers need no longer individually and autonomously construct and assemble interfaces for hydraulic drive solutions; instead, preconfigured I/O modules meet all hydraulic-specific requirements such as short circuit and overload abilities. They perform position detection, pressure detection, and proportional servo valve activation activities in real time via a sercos automation bus. The hydraulics expertise that goes into configuration makes it possible for users with little knowledge of fluid technology to select and activate the right I/O components with a high degree of scalability. 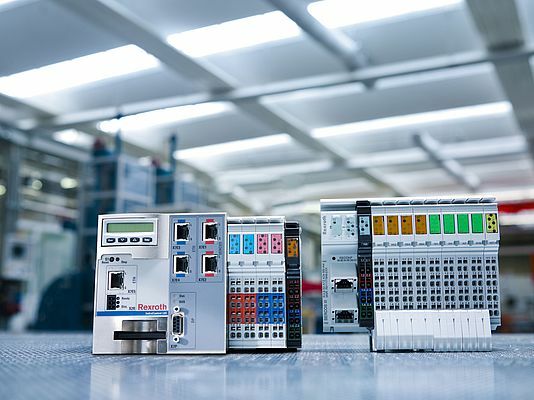 In addition, Rexroth's entire standard I/O line is also available for realtime-uncritical communication and is supported by all common field buses and Ethernet protocols. Universal I/O standardization of connections using fine-scalable modules simplifies engineering for combined electric/hydraulic machine concepts.